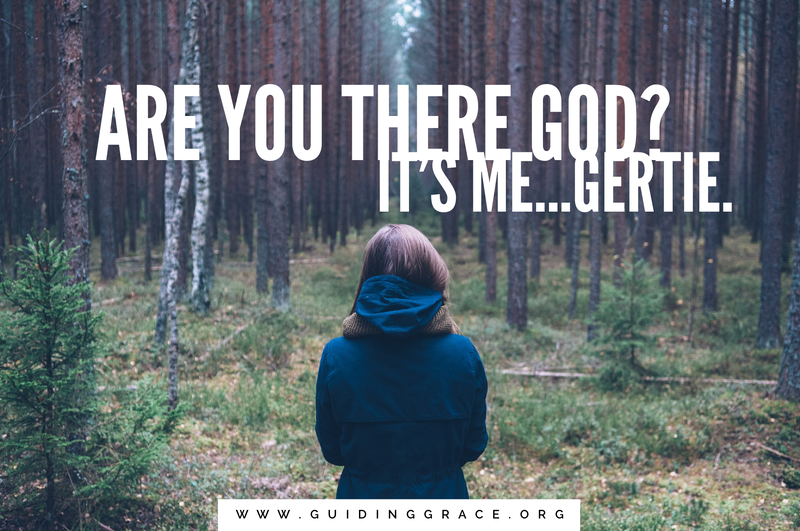 Are You There God? It’s Me, Gertie. When I started blogging two and half years ago, this is not the place I ever expected to take it. If you know me, then you know, humor is my MO. Sarcastic humor, none-the-less. It’s how I cope with things, especially when I feel uncomfortable – it’s a wall I could put up. And on the cusp of my 30th birthday, with the pressure to try online dating one more time, writing a blog about it seemed to be the logical next step. I mean because the first two times I tried it, it was so successful. See there’s that sarcasm again. But there are only so many funny encounters with online dating you can write about before it just becomes negative. And becoming negative is a slippery slope into bitterness. That’s the slope I was falling down over the last two years. Falling might not be the right word – sledding down on a rocket, at super-sonic speed, might be more accurate. It didn’t really hit me, that that’s what I was doing though, until Berta and I talked one night and she expressed her concern in not wanting to see me become the bitter, single 30something girl. We’ve both seen that girl in a story before, and trust me, it doesn’t end well…That girl? She’s now a 40something bitter, single girl. All I knew, coming out of that conversation, was that I did not want to become that girl. Bitterness is the quickest way to let go of your dreams, and letting go of my dreams is the one thing I can’t do. Why is that? Because I know God loves me enough to see those dreams He placed in my heart become a reality. So I did what my heart and soul know to do best; I cried out to God, asking if He was still there – still in the middle of it all – because I didn’t feel like He was. That song exactly summed up how I felt, and had felt for more than two years now. But all I kept thinking about was how friends had all told me that I needed to find contentment in my singleness. Contentment?! Obviously none of them had been single in their 30’s. Why should I be content with something I know is not God’s best for me? Just as He had been telling me all these years to “wait“, He reminded me of what he spoke to my heart sitting in service at the Southwest Believers Convention in 2013 and I knew it wasn’t about finding contentment in being single, it was about finding who I was in Him. God still has some work to do with me…I’ve got to learn to listen to Him and obey the first time He tells me something. I’d save myself a lot of heartache in the end for sure. But this time (I’m not going to lie, it’s the second time around), I obeyed and stepped way out of my comfort zone. And what have I been rewarded with? CONTENTMENT! and excitement and anticipation and happiness! I have found that I have a new excitement about church again, an anticipation of what God has in store for my future, and in general a new happiness that I know now can only be found when you seek God first. So look for a lot more posts like this. Luke 6:45 “…out of the abundance of the heart his mouth speaks…” or in my case, the fingers type and boy, oh boy, do I have a lot more to type. All in due time, dear readers. All in due time. Gertie is letting go of any negativity and bitterness and letting God’s contentment take over. unbelievablyunbounded – First, If that desire is there in your heart, then I wholeheartedly believe it is because of God (He is the one who puts that desire there) and He definitely has someone for you! Second, don’t let doubt take root in your life. Seek God’s word about His plans for your life, pray it out in the Spirit, and REST in His peace. When you put your faith in God and His plans for you, even if they aren’t all known to you at this time, you’ll find your peace. Trust in God just as much as you trust to take another breath. He won’t let you fall. I am not married yet. I’m not even dating someone at the moment….But I’m learning to trust in God because I know how much He loves me and His word says His love never fails. Very, very true. Thanks for the advice. (: I will definitely work on hearing God speak to my heart and following His direction. I. AM. SO. PROUD. OF. YOU. This is the true heart of Gertie. Thanks Berta! It means a lot. Miss you! !